Kostroma. Trip to Golden ring. Tour to the cities of Russia. Trip to Russia. Legendary tour. Kostroma, a beautiful city on the great Russian Volga River, was founded by Prince Yuri Dolgoruky on a famous trade route "from the Variags to the Greeks" in the middle of the 12th century. The location was so good that the new settlement soon turned into one of the largest trade and handicrafts centers in Russia. After the big fire in 1773, the whole trade and administrative ensemble - one of the best examples of Russian classicism - was erected by Russian builders. Kostroma is one of the best places in Russia to see old wood buildings richly decorated with carved wood: in the open - air museum of the 16th - 18th centuries visitors can see, among other wooden objects, wind mills, peasants izby (huts), Russian bath houses, and wood churches. The pearl of Kostroma is the Ipatiev Monastery, built in the 16th century: it played an important role in Russian history. "Treasure Island,'' a unique part of the Vargazine taiga, is in the Kostroma region. It is prohibited to cut down trees there. They are 400 to 500 years old and up to 50 meters high. Only there can one come across resonant spruce and rare kinds of fish (grayling) and animals (glutton). Monastery of St Ipaty. The monastery's history is closely tied to the Godunov and Romanov families, fierce rivals in high-level power games before the Romanovs established their 300-year dynasty in the 17th century. The Godunovs, descended from a 14th century Tatar chief who converted to Christianity, built the monastery's Trinity Cathedral (Troitsky sobor) - first a wooden one, then the present white-stone building with gold domes in 1590. Inside are over 80 old frescoes by Kostroma painters (plus some 20th century additions) and a gorgeous iconostasis of gold and carved wood. In 1600 Boris Godunov, the only member of his family to become tsar, exiled to this monastery the head of the Romanov family, Fyodor, along with other Romanovs, including Fyodor's son Mikhail. 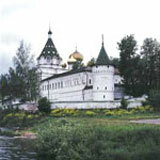 Mikhail Romanov was in Kostroma when he was elected tsar in 1613, at the end of the Time of Troubles, and in honour of the event all his Romanov successors made a point of coming here to visit the monastery's red Romanov Chambers (Palaty Romanova), opposite the cathedral. Museum of Wooden Architecture. A group of garishly painted wooden houses behind the monastery have nothing at all to do with traditional architecture but were a set for the Russian-Italian film Black Eyes. But beyond them is an attractive outdoor museum of northern-style wooden buildings (Muzey derevyannogo zodchestva), including peasant houses, churches (one built without nails) and a windmill. Town Centre. Ploshchad Susaninskaya was built as an ensemble under Catherine the Great's patronage after the 1773 fire and looks like a movie set. Clockwise around the northern side are: a 19th century fire tower (still in use, and under UNESCO protection) with a little museum on fire-fighting; a former military jail, an 18th century hotel for members of the royal family; the palace of an 1812 war hero, now a courthouse; and the town hall. In the streets between are many merchants' town houses. Ulitsa Pavlovskaya 5 and 7 - now part of the Art Museum (Khudozhestvenny muzey) - were originally built in 1913 as a museum of the Romanov family, to celebrate 300 years of their rule. On the southern side of ploshchad Susaninskaya are attractive, 18th to 19th century pillared Trading Arcades, now housing several art and antique shops, and a food market. The monument in the park between the arcades is to local hero Ivan Susanin, who guided a Polish detachment hunting for Mikhail Romanov to their deaths - and his own - in a swamp. Churches.The main functioning church in Kostroma is in the Monastery of the Epiphany (Bogoyavlensko - Anastasinsky monastyr) at ulitsa Simanovskogo 26. The large cathedral in this 14th to 19th century complex has been recently and brightly restored and is in full working order. Restoration continues on the surrounding monastery buildings. The 17th century Church of the Resurrection (Tserkov Voskresenia) near Hotel Volga, with bright patterned exterior decoration, was partly financed with a load of gold coins mistakenly shipped from London. Tour R0301. Moscow – Suzdal – Vladimir – Diveevo – St. Petersburg (11 days / 10 nights). Tour R0203. Moscow – Golden Ring ( 7 days/ 6 nights).